American Airlines magazine American Way wrote an article about how URB-E, the foldable electric scooter, is solving the pain points of transportation and is the pioneer in the micro transportation industry. 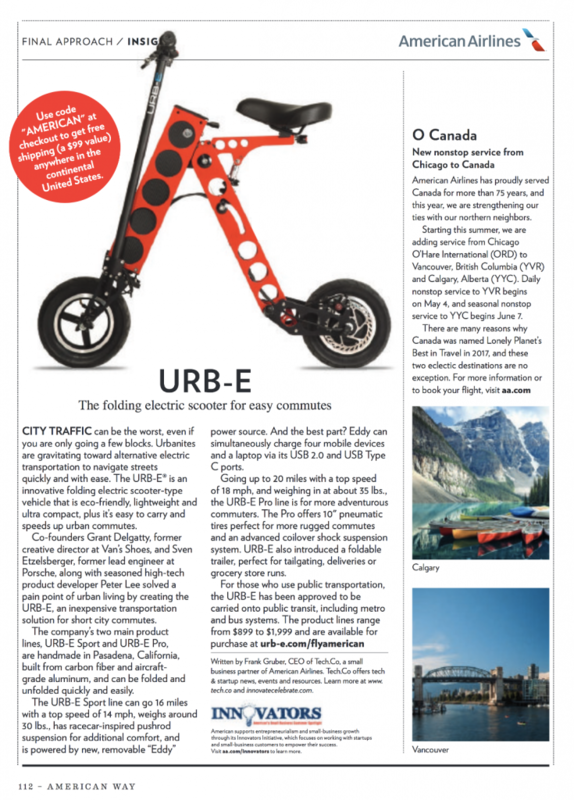 URB-E is the inexpensive solution for short city commutes. Gone are the days of driving a car to go to the grocery store. Any short city commutes can be handled with URB-E. The URB-E Sport can go 16 miles per charge and 14 miles per hour. It also has racecar-inspired push rod suspension and is powered by the Eddy a battery that can simultaneously charge 4 USB devices as well as a USB-C device. The URB-E Pro can go 20 miles per charge and 18 miles per hour. It has 10" pneumatic tires to handle more rugged commutes and an advanced coil over shock suspension.